There are no easy ways to make the difference when tackling the poorest of the poor. Many talks and seminars during the Skoll World Forum have aimed at facilitating the sharing of ideas among entrepreneurs, investors, facilitators and representatives of governments and public bodies on how to best operate in areas where nothing can be taken for granted. However, the session “The Impact Jackpot: Service Delivery Innovation for the Very Poor” was especially effective in exploring the topic. The panel featured Christine Mwelwa Kaseba, first lady of Zambia and champion of several projects in her country for the improvement of women’s health; Kristin Gilliss, associate portfolio director of Mulago foundation, investing in high impact organisations tackling the very poor with a scalable model; Neal Keny-Guyer, CEO of Mercy Crops, an international development organisation operating in areas of conflicts such as Syria to transform crises in opportunities; Steve Davis, CEO of Path, a non-profitspecialised in innovation for healthcare; and Andrew Youn, co-founder and director of One Acre Fund, an NGO improving the productivity of the poorest farmers through support along their whole value chain. The panellists discussed very openly about their projects, the difficulties they encountered and how they innovated in order to reach the bottom of the pyramid. The passion and commitment they showed for their companies and causes generated a strong involvement in the audience, which was clear from the many faces nodding during the session and from the questions and feedbacks expressed during the Q&A part. Most importantly, the discussion revealed a common theme emerging from each experience reported regarding effective serving of the poorest of the poor: the necessity of creating strong partnerships across sectors. The topic was brought up in his very first answer by Neal Keny-Guyer, who mentioned partnerships as the fundamental element to innovate and reach populations facing crises and lack of any kind of resource. His statement was then reinforced by all following interventions, that even went beyond it by explicitly mentioning the necessity to co-operate with local governments in order to have different stakeholders coming together and understanding each other and to connect different countries and players engaged in different programs in order to share best practices and uncover new ways to employ existing tools and resources. Similarly, the panel highlighted the potential of partnerships between NGOs and social enterprises allowing to fully exploit and combine the reach and connections of the former with the innovativeness of the latter. Additional suggestions that social entrepreneurs as well as governments, funders and NGOs might find interesting were those of Andrew Youn and Steve Davies, who both focused on the necessity to redesign the whole distribution chain and to think about the whole ecosystem when planning to deliver something to forgotten communities. Indeed, in order to reach such populations and to really make the difference, it is necessary to trigger behavioural changes, to make recipients understand the products offered and how to use them, to reach people where they are, and to develop products and services keeping in mind from the very beginning the money, mobility and information constraints that these populations face. The importance of connecting with and providing detailed information to target recipients was confirmed by Zambia’s first lady Christina Mwelwa Kaseba, who recalled how important information sharing had been in the projects she championed in order to make poor women aware of their rights, opportunities and of the services that were available to them. In this regard, she mentioned the relevance of new technologies in engaging with people in a visual and easy-to-understand way, another theme clearly emerging in many sessions held during the Skoll World Forum. 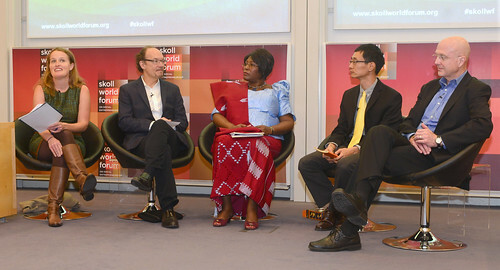 Overall, for me the key take-away from this session was panellists’ conviction, supported by the Skoll foundation’s belief and from similar conclusions reached in other seminars, that no real impact can be generated if a project does not trigger systemic change and does not go beyond the delivery of a mere service or product. What the poor need is a chance to speak up, to develop themselves in the way they need and want through products and services configured around them and with their contributions, to hope in a better future thanks to someone helping them in reducing inequalities, that are one of the main barriers of economic and, most importantly, social development. Partnerships and connections are the key to succeed in this important mission. After three days of networking, it feels like we all should be in a better position now to go reach the bottom of the pyramid and make even more the difference.